Xbox's Major Nelson reminds everyone that the Xbox One is not, and never will be, backwards compatible. A rather cruel "prank" is doing the rounds on the internet, originating from 4chan (where else?) 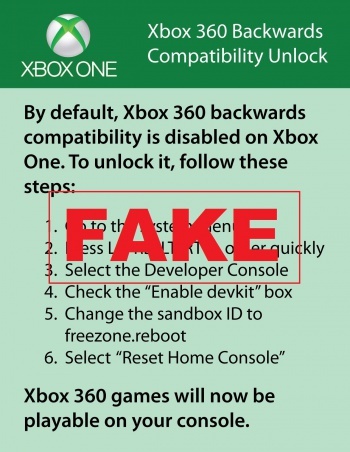 and claiming to "unlock" the Xbox One's backward's compatibility with Xbox 360 titles. The problem is, that it doesn't unlock said compatibility, and will probably brick your console. You can see the image itself to the right, so if you see it being linked on Facebook or Twitter by unknowing friends, be sure to do them a solid and let them know it's fake. The fake image utilizes the Xbox One developer menus that were discovered earlier in the week, and exploits the average user's gullibility by looking fairly technically and official. It looks like Microsoft wasn't kidding when it asked folks nicely to not muck around with the dev menus. To further clarify things, Xbox One's Larry "Major Nelson" Hyrb took to Twitter to warn gamers that "there is no way to make your Xbox One backwards compatible & performing steps to attempt this could make your console inoperable." Apparently, what the hack does is simply force your machine to reboot endlessly, essentially "bricking" the console. While some would say it is worrying that Microsoft left such a "feature" in the system, it's very clear that it's not really something the average user would stumble upon anyway.